Stem: 1--6 dm. Leaf: petiole 1--2 cm; blade 1--3(4) cm, ovate to +- round, base +- lobed, margin crenate to serrate. Flower: calyx 5--7 mm; corolla 10--20 mm, pink-purple. Chromosomes: 2n=18. 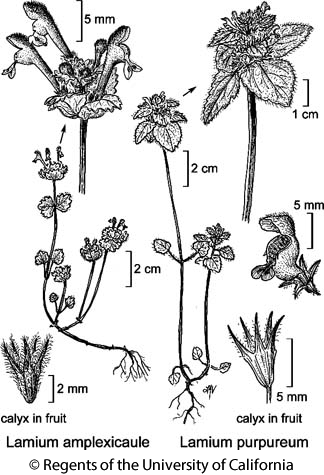 Citation for this treatment: John M. Miller & Dieter H. Wilken 2012, Lamium purpureum, in Jepson Flora Project (eds.) Jepson eFlora, http://ucjeps.berkeley.edu/eflora/eflora_display.php?tid=30155, accessed on April 24, 2019.